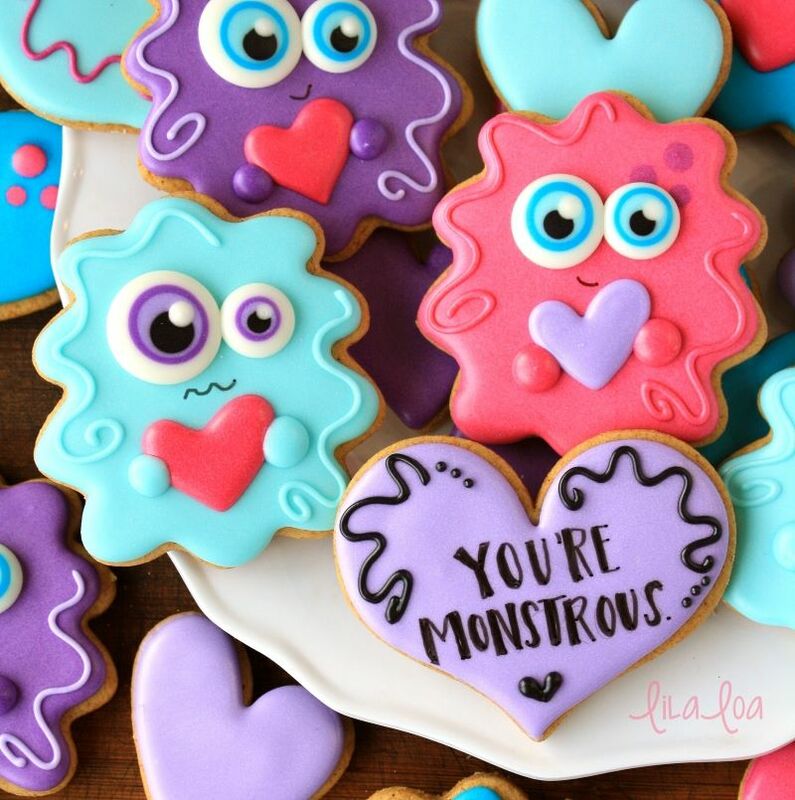 Learn how to make some ADORABLE Love Monster decorated sugar cookies with this royal icing cookie decorating tutorial!! My birthday is next week. I'm not normally a big birthday-celebrater kind of person, but I just realized that I spent the entire year telling people that I was 38 years old. And... after a little wrestling match with some math...it turns out that I am in fact, actually only THIRTY SEVEN YEARS OLD. You guys! I cheated myself for an entire year! Now I feel like I have to make up for it by shouting to anyone that will listen that I am exactly 37 years old...for a few more days at least. And now I'm realizing that grown up people don't usually go around telling everyone how old they are. This is going to be A LOT harder to work into a conversation than I actually thought. "Oh, hey grocery store teenage produce guy! Do you know where the milk is? Oh? It's in the same place it always is? Cool. Cool. I'm 37. Not 38. See ya. I'm just going to go grab some milk now." "Yeah...so turns out I'm only 37 years old. For the week. It's complicated...and...ummm... WOW!!! IT'S FREEZING OUT HERE!!! Who KNEW it would be just as cold as it was yesterday and the day before that and the MONTH before that?! Certainly not THIS 37 year old!!" Actually...I kind of slid that last one in there and I'm not hating the way it came out...I think I'm getting better at this. Also....and this has nothing to do with the fact that I'm still 37 years old... I kind of think this message cookie is REALLY funny. I laughed to myself every second I was making it. Turns out...I'm actually a TEN YEAR OLD, I guess. 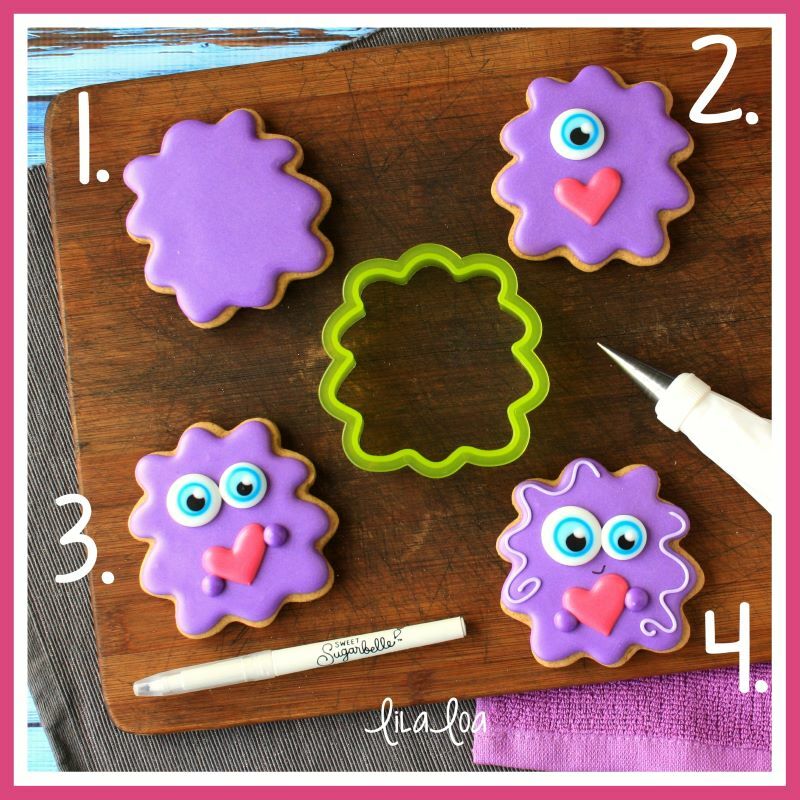 Outline and fill the entire cookie with a medium consistency purple icing and a #3 tip. Let the cookie dry for at least four hours. At this point...the eyeball is probably starting to dome up. 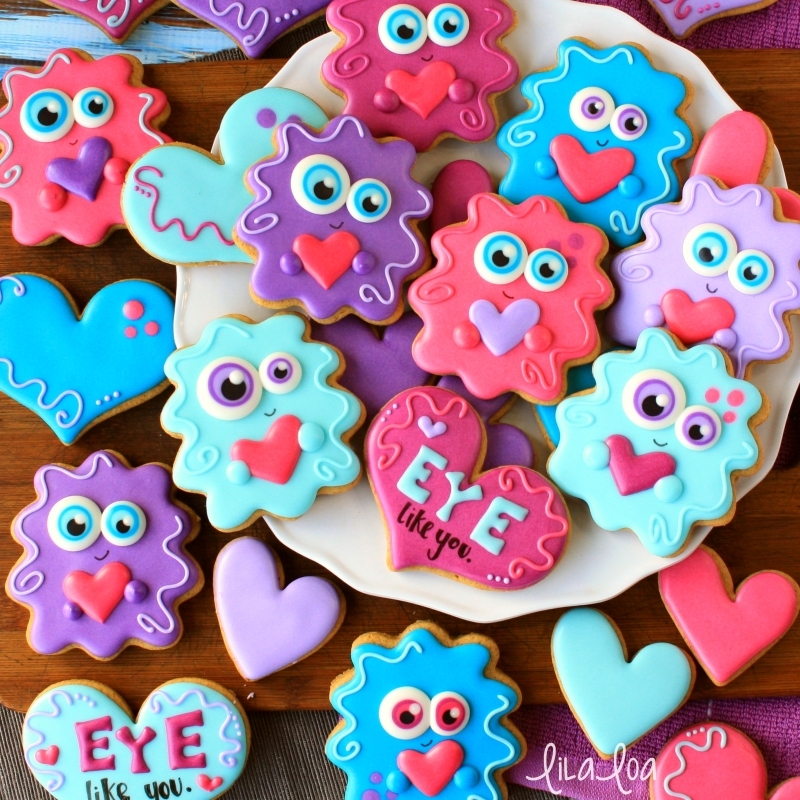 Give the cookie a few taps to flatten the surface of the eyeball. Add a dot of black icing to the center of the blues. Then pipe a much smaller dot of white icing to the top right edge of the black dot of icing to give it that "just looked at a lightbulb" look. Pipe a wonky heart under the eyeball. I intentionally made the heart wonky to kind of balance out the lopsided eyeball situation these guys have going on. Let the cookie dry for about 15 minutes. Pipe a slightly smaller eyeball using the same steps as above. Pipe two small dots of purple icing on either side of the heart for the little monster hands that are desperately clutching the heart. Use a food color marker to give your guy a little smirking smile. Add squiggly fur details with a light pink icing and a #1.5 tip. Get the supplies: Monster Cutter, Large Heart Cutter, and Black Food Color Marker. Grab the COLOR FORMULAS for all of these icing colors! 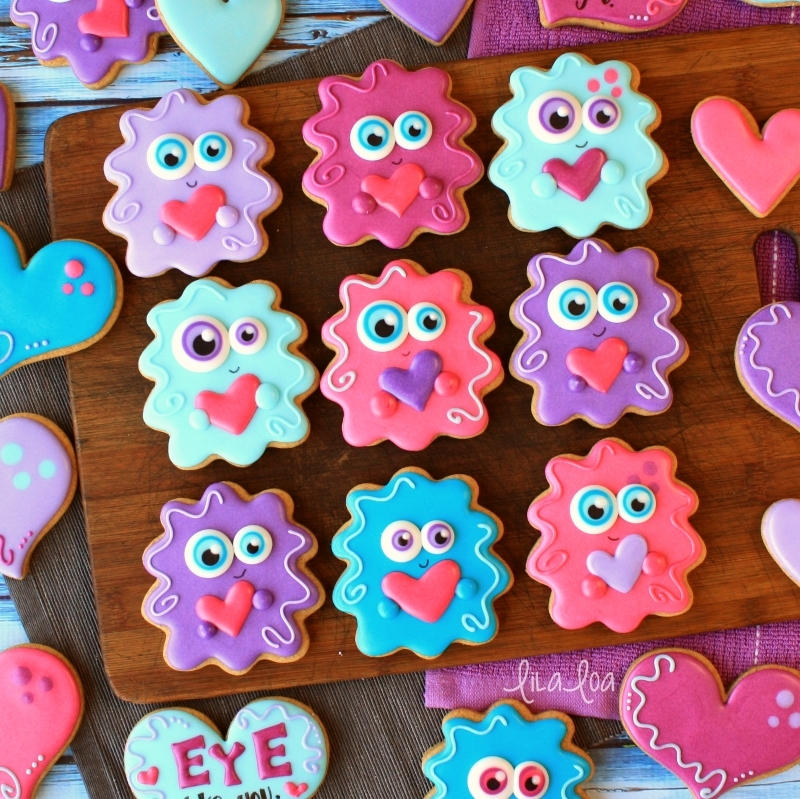 Check out Sweet Sugarbelle's SILLY DECORATED MONSTER COOKIES. Want something even EASIER? Grab the tutorial for these WILD THING COOKIES.